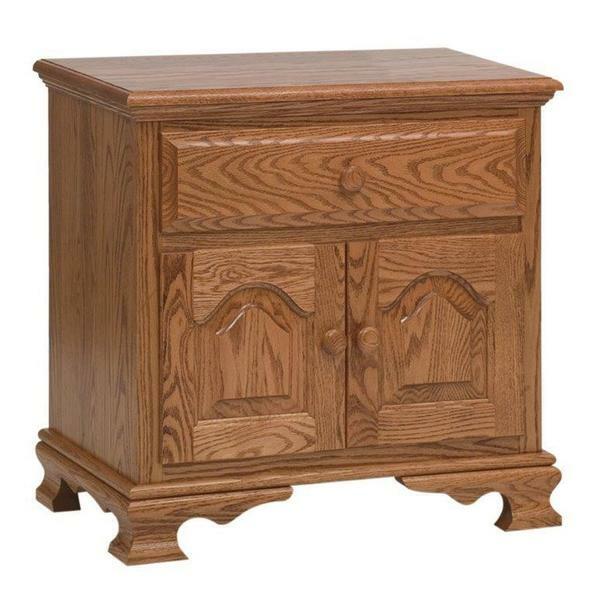 The lovely Amish Heritage Nightstand with Two Doors and Drawer is a bedroom essential. Balance the design of your bedroom and treat yourself to some stylish storage. A solid wood nightstand is both convenient and functional. Achieving a relaxing atmosphere in your bedroom includes having items you need within arms reach. The Heritage is ready to hold your evening drink, phone, magazine and more nearby. The display of solid wood warms your bedroom furniture collection. The Heritage Nightstand is shown here in solid oak, which is known for its strength, durability, and beauty. Your solid wood nightstand is Amish made in America with the premium quality hardwood of your choosing. The Heritage Nightstand offers two drawers that open to provide a storage cabinet, as well as one drawer to hold your Bible, eye mask or lotions nearby. Customize your solid wood nightstand by adding soft close drawers that respond to a light tap. Height: What height are you looking for to balance your bedroom decor? Storage: What items do you want to keep nearby? Do you need one drawer or more? Beauty: What wood type speaks to you? Select the solid wood you love knowing your solid wood nightstand will last. Be sure to explore our collection of Bedroom Benches to discover exquisite seating options for your bedroom. Call one of our Amish Furniture Specialists today at 1-866-272-6773 with any questions.